The posted screenshot from the new Super Smash Bros could just be in commemoration of Wii Fit U or it could be something more. Super Smash Bros. director Masahiro Sakurai posted a game image taken during development. 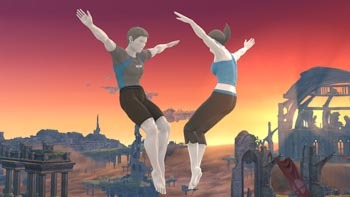 The image, taken from the Wii U version of Super Smash Bros, shows our familiar Wii Fit Trainer with a male counterpart, both of them striking the same mid-air pose. Posted as a picture of the day on Miiverse, Sakurai wrote, "The trial version of Wii Fit U is available now! We'd like to share this pic to commemorate the occasion." Sakurai did not say anything else on the male Wii Fit Trainer. Making him a new character would make little sense as there are only so many spaces left in the roster. He also does not have his own page on the official site as a newcomer. It's possible the screenshot means little more than a celebration of Wii Fit U, but the male trainer could be an alternate costume for Wii Fit Trainer. If that's the case, maybe an alternate costume will exist for the Animal Crossing Villager, giving the player a choice to fight as a male or female villager. If the Pokemon Trainer character returns, it would be great to see a female alternate costume for that character as well. The Wii Fit Trainer is one of three newcomer characters announced so far for the upcoming Super Smash Bros game on Wii U and 3DS. The game is expected to launch sometime next year, and there's still time left for more characters to be announced.